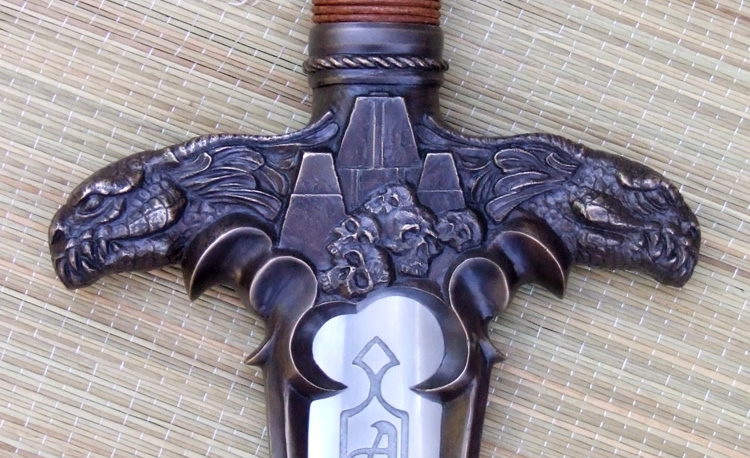 The concept for this sword was to use the basic silhouette of the Atlantean but to go in a different direction with design elements and symbolism. It makes use of the myth that some of the greatest ancient civilizations were related by a common ancestral society that existed before the flood. The creature on the guard is horned and has a mane of feathers/fins/scales. It is meant to be the precursor of the Mesoamerican Quetzalcoatl. He is emerging from the breaking waves of the deluge. In the center of the guard are three structures that resemble both pyramids and ziggurats to give the idea that they are forerunners of both. At the bottom of the structures is a pile of human skulls. These are meant to be the sacrifices that the ancient civilization offered up to prevent the catastrophe, though they could also be viewed as the dead warriors who fought against the destruction, or even the defeated enemies of the ancient society. An endless circle of rope is above the structures. 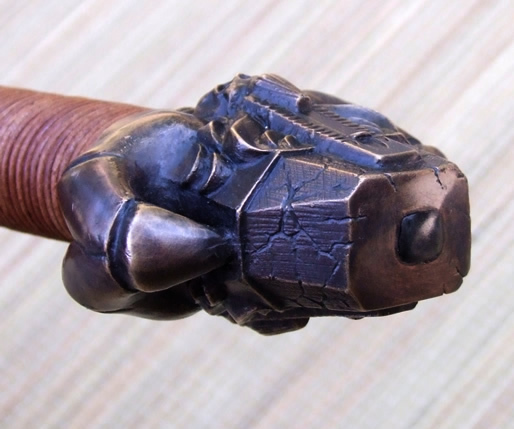 The pommel, when viewed with the blade down, is the central great structure of the ancients. It has a triptych entryway as found on many ancient buildings and is again similar to a pyramid or ziggurat. At the bottom of the stairs is a fallen skull. The whole structure is being grasped by the enormous claw of the creature and is engulfed in flames/flood. 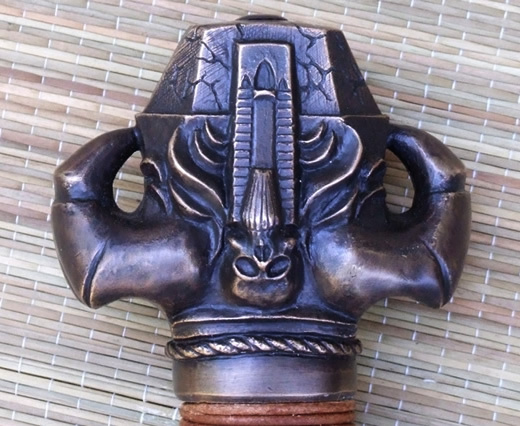 When viewed with the blade up, the pommel is a skull with long hair and gigantic horns resting atop an altar. The endless circle of rope from the guard is mirrored on the pommel. 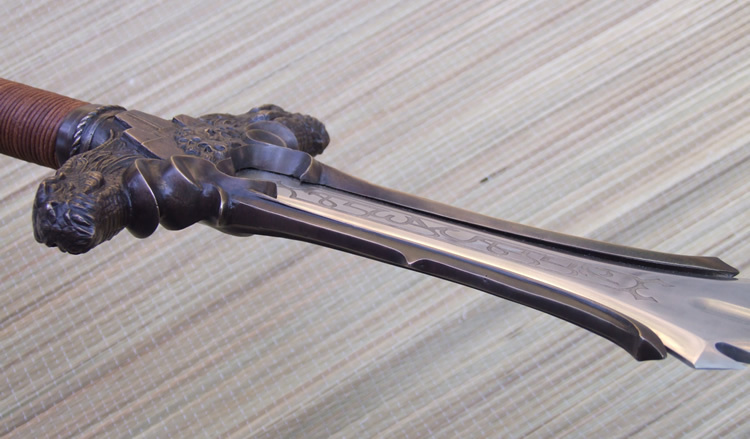 The blade is 1075 high carbon steel that is hardened and tempered. The guard and pommel are bronze. The guard is press fit and banzaipeened to the shoulder. The pommel is hot peened and banzaipeened to the tang. The grip is an epoxied wood core with a leather cord wrap. 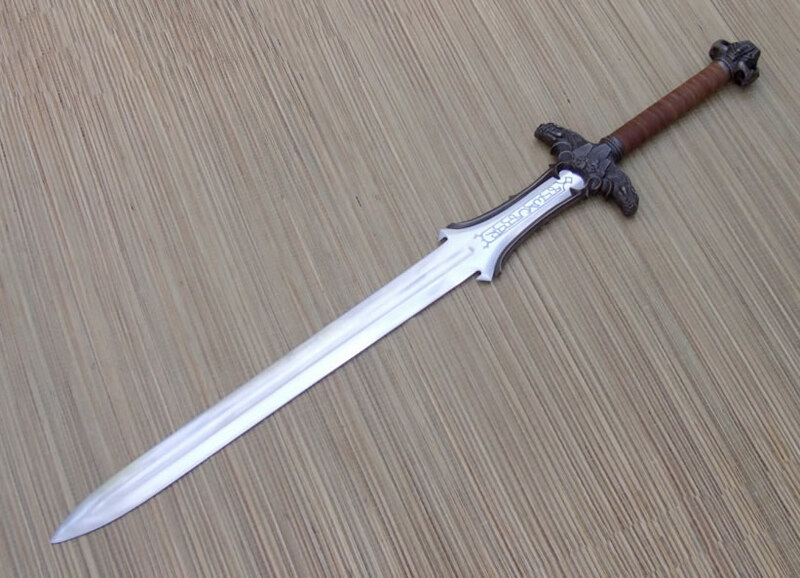 The sword is a massive 7 pounds. 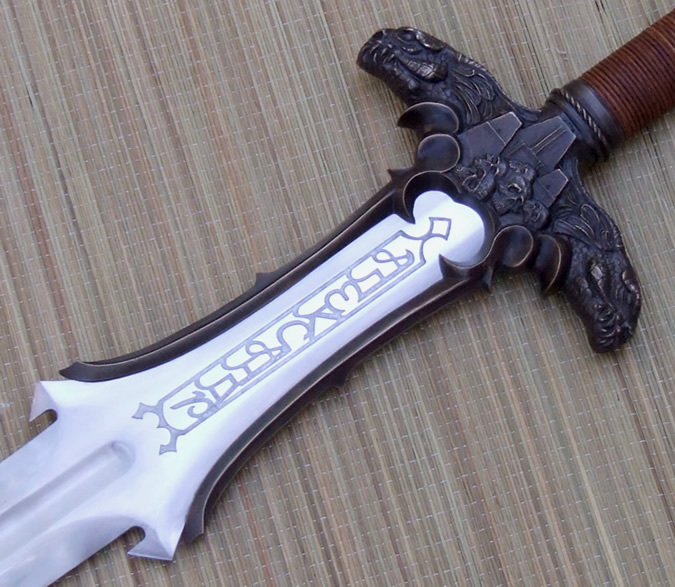 This custom sword is sold but another one could be made. Cost is $3100 with customized etching.